Just In Time For The Fall Term/Semester! The Office of Academic Technology is excited to announce the availability of a new tool that lets you record short videos directly from within your course using a webcam! 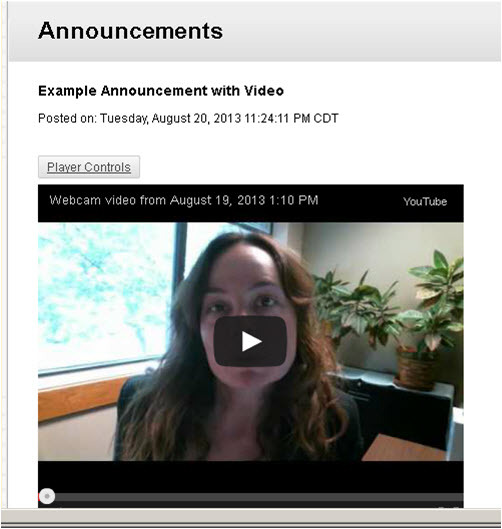 For example, you can create video messages and mini-lectures and post them as announcements. This video tool is available now and is very easy to use (provided you have a webcam). Using either our step-by-step guide or our how-to video (5 minutes) you’ll be creating your own videos in about 15 minutes. It’s that easy and your students will appreciate seeing and hearing you.